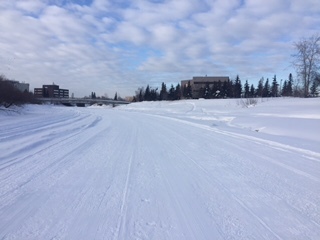 Groomers were out on the Chena River today in preparation for Saturday’s Sonot Kkaazoot. Ken Coe has deemed their handiwork as “race ready” after they finished today. Classical tracks in both directions will be set on the morning of the race to make sure that they are not damaged overnight. Also, Bad Bob Baker spent over an hour today doing test drilling of ice thicknesses on the first 0.5 km of the course. Even in the “bad looking thin spots”, the ice was over a foot thick. Thus, barring some unforeseen weather anomaly before Saturday, we’re a “go” for the traditional start and finish line of the 30th annual Sonot Kkaazoot. Remember, that early bib pick-up is Thursday, 23 March 2017 at the Doyon Ltd, Headquarters from 5 to 7 p.m. All late registration must be done online. See the “register” tab at the top of this website. 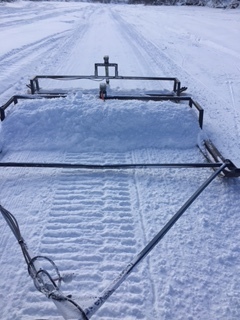 This entry was posted in 2017 Sonot Kkaazoot information, Sonot Kkaazoot grooming, Sonot Kkaazoot race organizers and tagged Chena River trail grooming by Sonot Kkaazoot. Bookmark the permalink.